Detached winterf. House, bright and spacious, 93 sqm, 5 rooms, 1 "American" kitchen, 1 guest toilet on the ground floor, 1 bathroom / WC upstairs. Central heating m. hot / cold water. Good enough equipment in all areas. TV in German and various. Languages. Internet on request and 5 bicycles. Beautiful, natural plot with forest and meadows on its own edge of the forest, lawns with all-day sun. Quiet location, no through traffic, lined with hedgerows and trees, surrounded by pure nature. Beaches and natural beaches and swimming and barbecue areas within walking distance from 300 m.
In Sätra you can rent canoes, fitness, physio, sauna, outdoor whirlpool, bike paths and guided hikes. Restaurant in the mansion known for the game and fish specialties. Sätra is centrally located between the Vättern and Lake Vänern with the famous Göta Canal, which flows through the 1 km distant Vikensee. Passenger ship cruises possible, z. B. from Töreboda, Karlsborg, Mariestad. But also heated swimming pool with mini golf, snack bar, in Töreboda, about 15 km distance. Tiveden National Park an experience. The knight games in Hova, craft market in Askersund, Forsvik shipbuilding museum and summer theater, many locks to stay, miniature golf, bouncy castle, canoe, rowing and much more. , Mushroom picking berries and last but can also be in the area include moose. Cranes are permanent guests. Especially worth seeing the fortress in the garrison town Karlsborg with various activities for visitors. Electricity: per object and week Costs of 70 EUR (compulsory). Water: per object per week costs of 40 EUR (compulsory). Sätra is a small park-like village, away from the roads and practically no through traffic. It lies idyllically between the lakes Edsån and Viken, is framed by forests and meadows - simply beautiful. Due to the quiet, beautiful and yet central location of the house, located directly on the edge of the forest, on predominantly natural land, interests of various kinds are taken into account. Whether pure tranquility in nature, fishing and swimming, cycling and hiking trails or trips to the surrounding towns and villages, the TIVEDEN National Park, all within easy reach. The lakes are ideal for swimming, barbecues and fishing. 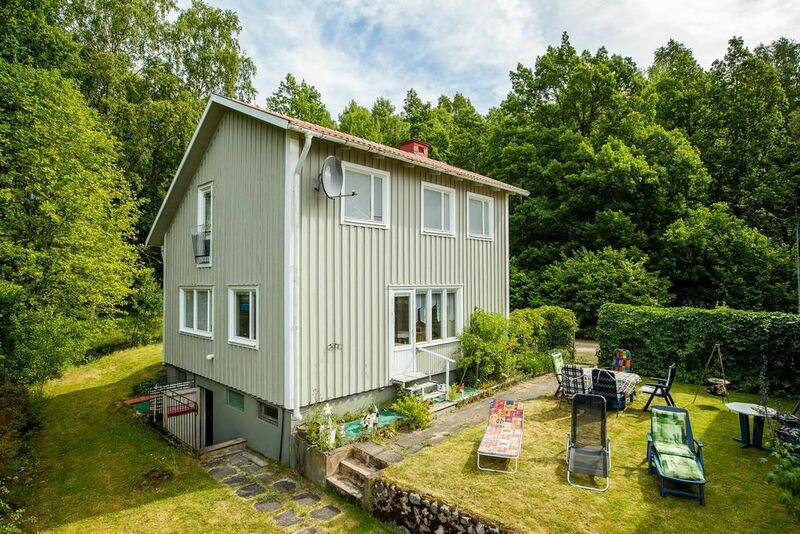 Within walking distance of the Edsån and Vikensee with 150/300/1000 m distance. Especially on Vikensee you will find natural and sandy beaches, often equipped with barbecue areas. In the mansion there is a restaurant, known for the game and fish dishes. Some leisure activities, such as 2-day horseback riding, fishing, ice fishing, photography classes, etc., are offered. A small fitness center / Vandrarhjem is in close proximity to relax and unwind with massage / physiotherapy, sauna / Bastu, outdoor whirlpool of the luxury class. There are also hikes, Nordic walking, canoe rental, fishing licenses for the Edsån (with game fish) offered. A coffee with boutiques complements the collection, you can get information z. For example moose in the area, mushrooms, berries, fish ... everything cozy! Sätra is also centrally located between the large lakes Vänern and Vättern. The famous Göta Canal crosses these lakes and, as a mighty waterway, connects the west and east coasts. Many small places at the locks with lively bustle invite you to linger. Even a historical hauling of the passenger ships by oxen, as in earlier times, can be observed in Norrqvarn. Sätra is by post to Undenäs and is about 7 km away. There is a supermarket, petrol station, post office, parish hall, library, pizzeria. Many activities and events, including concerts of all kinds take place in the church. Here also crosses the way to the Tiveden National Park. A cozy home coffee with great views and a summer theater invite you to linger. But also passenger boat trips from Karlsborg, Mariestad or Töreboda are fun and offer many natural impressions from a very own point of view. Many information can be obtained in the garrison town of Karlsborg, about 15 km away, at the Tourist Office on the harbor. Internet (once per object expenses of EUR 50). Parking (per Object and day, included EUR 0).